In his 1948 series ‘A Newspaperman Looks Back: Stories of 25 Years’, published in The Stirling Sentinel, veteran local journalist Alfred G. Reilly reflected on the odd experiences reported by miners from the nearby Millhall coal-pits, in 1926. 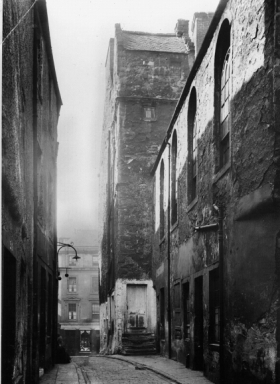 A strange figure garbed in white had been observed by quarrymen as they trudged back towards their ramshackle residences in the Old Town, after the Night-Shift was complete Thus began the curious – and near-forgotten - mystery of the ‘Millhall Ghost’. Something about the figure unnerved the miners. These were hard men. Superstitious, perhaps – as those occupied in perilous professions often are – but not easily alarmed. Alf Reilly recounted the observations of a lamp-cabin attendant on the Millhall Road – a sober, stolid chap – who told of the miners ‘walking in companies of ten or twelve’, so fearful were they of this silent figure who ‘strutted about the roads’ as though ‘enveloped in a white sheet’. These strange apparitions continued from February to April, the figure vanishing into darkness as soon as inquisitive workers ventured too close. In May came the ‘Nine Days Wonder’ of the General Strike, which led to a longer dispute between local miners and pit-owners which dragged painfully on for many months. The miners, striking for better pay and conditions, received little sympathy from their better-off neighbours in the Burgh. 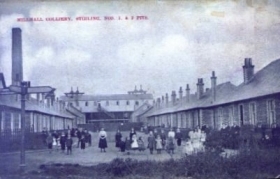 The Stirling Sentinel newspaper bewailed ‘Mad Britain!’ and called the stoppage ‘a disaster upon a disaster’, hypocritically railing against the selfishness of the strikers at incurring a tally of £1565 on the town for Poor Relief - alongside woeful accounts of their malnourished offspring and the County Medical Officer’s opinion that one in four of their rented lodgings was ‘unfit for human habitation’. For whatever reason a mysterious something or someone frightening miners was not going to concern the majority of Stirling’s citizens. With the pit empty accounts of what was now known as the ‘Millhall Ghost’ did not cease. Instead they moved into the very heart of the Old Town. A woman returning from visiting a family friend was alarmed by a still and silent ‘white-clad figure’ as she hurried home after midnight through the Ballengeich Cemetery; a lad was terrified by a still and silent spectre as he strolled through the Raploch; and when a Castlehill woman fainted after a frightful blank-faced figure flashed by her window, panic took hold - about a hundred people, armed with lanterns and cudgels, furiously searching the Castle Hill for the phantom. What they expected to do if they actually trapped the spook is a mystery. 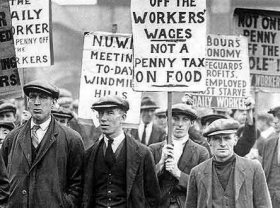 The strike was broken, along with the spirits of the starving miners, and the quarrymen had no choice but to return to work or face further privations. The ghost appeared one more time – albeit briefly – on the summit of the Ballengeich, seeming to look down disparagingly on the defeated miners. Alf Reilly was persuaded by the editor of the Labour newspaper, the Daily Herald, to spend an evening in the Ballengeich Cemetery: ‘it was a nice night’ he reported. ‘I spent four or five hours there but not a sound did I hear, except having a chat with the policeman on night duty.’ Questioned by the constable as to his reasons for loitering there Alf quipped that he was just “waiting for the Millhall Ghost”. Alf’s biographer, R. J. Ritchie, wondered if such ghost-sightings were real or simply mass-hysteria - a ‘creation of our subconscious mind which intrude into our consciousness as an apparition’. If so, then the disappearance of this peculiarly political phantom may be put down to the environmental exorcism provided by the urban improvement programmes of the following quarter century, as the hovels of the Old Town were torn down in the 1950s, and replaced (though the facades of the older buildings in Broad Street remain) with modern housing. The tale has not completely vanished, however. Tollbooth theatre technician (and former Stirling GhostWalk actor) James Wigglesworth recalls a childhood memory of trembling with terror in the back seat of his elderly aunt’s car as they drove by night through modern Millhall, early in the 1970s – the impressionable lad having heard of a shapeless white wraith said to haunt that lonely road......though by that time the wraith’s association with the pit or its unfortunate miners had been all but forgotten.